How to Adjust Broadcasting with Delay? We often need rebroadcast of the accepted signal with the time shift of a few hours. The server software module Time Shift is used for implementing this function. The module has one input, one output and allows setting the necessary value for the delay of the output stream relative to the input signal in hours, minutes, seconds. The maximal value of delay is 240 hours, the minimal value is 3 minutes. Step 1. Add a new component (module Time Shift) to the configuration of the server. By the right click on the blue icon SL NEO in the taskbar, choose Stop Server and stop the server components. After some time the icon will change its color to red. Right click on it and choose the item Configure Server Components. 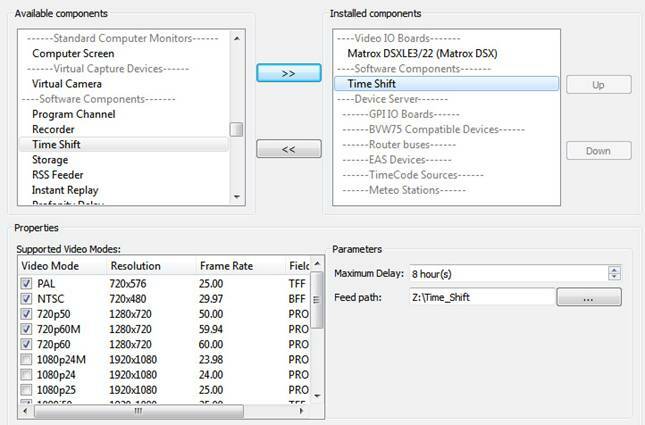 Find the field Available components in the setting window and add the element Time Shift to the right field. The module Time Shift is functioning simultaneously with the I/O devices; you should consider that the appropriate element of the server software responsible for input/output should be present at the system. Open the window Parameters and set the value Maximum Delay (the time value that defines the maximal delay in hours). The recordings will be saved at the disk during the set time, the “later" information will be automatically deleted. In the field Feed Path specify the way to the folder that will store files in the process of recording. After the start of server software, further adjustments will be implemented from the Administrator Control Panel. Login to the console is implemented locally from the server, or from any machine in the network by the address http://ip of the server:7901. You should login to the control console as an administrator. After login to the console, choose Manage from the left menu, then find the section Time Shift and choose Service Enable in the window Time Shift 1. Choose the needed TV format from the field Video Mode, set the number of audio channels in the field Audio Channels. The module Time Shift works with uncompressed streams that come from the adjacent software modules. It means that the compressed streams, received by the module AV/TS Capture through the ASI/IP interfaces, will be decompressed and encoded again when recording into files. Set the needed value of delay in the field Time Offset. Find the fields Video Codec, Bitrate, GOP Size and choose the algorithm of encoding and compression of the parameters (the speed and size of the group when using the MPEG algorithms). 1. From the Capture input to the Time Shift output, from the output of the Time Shift module to the input of the Playout module. 2. From the output of the Capture module to theTime Shift input, from the output of the Time Shiftmodule to the BG input of the Program Playermodule. In this case it is possible to implement commercial inserts into the delayed stream and overlay graphics. 3. 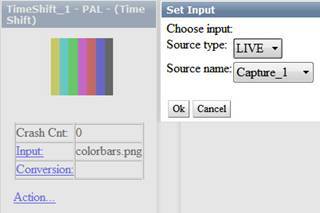 From the output of the Capture module to the inputs of several Time Shift modules, from the output of every Time Shift module to the input of the appropriate Playout module. In this case you can implement delay from one input to a few outputs, with different time values of delay. For switching the stream to the input of the Time Shift module, you should choose the item Input in the appropriate icon: choose the type of source LIVE in the opened window, then choose the needed capture service in the field Source name. 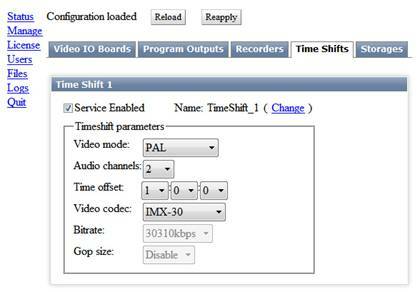 Use the same way for setting the stream from the Time Shift output to the input of the Playout or Programservice.